After the inauguration of President Donald Trump, a Texas couple decided to emblazon their GMC Sierra with a brusque message: “F**K TRUMP AND F**K YOU FOR VOTING FOR HIM,” complete with a depiction of a middle finger. The driver, Karen Fonseca, has now been arrested on an outstanding warrant, issued in July 2017 in connection to a 2015 case of possession and use of a fake ID, according to the Houston Chronicle. She also said that the sticker has made her a target for cops, who have pulled her over several times "but failed to find a reason for writing a ticket," wrote the Houston Chronicle. 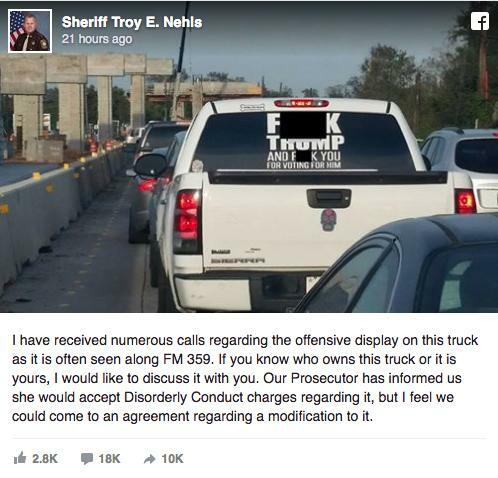 The decal sparked controversy when Fort Bend County, Texas sheriff, Troy E. Nehls — whom Fonseca says she used to work for — posted an image of it on Facebook claiming that he was searching for the then-unknown owner of the truck. The post drew thousands of comments, some applauding Nehls and others criticizing him for impinging the driver’s First Amendment right to free speech. But the American Civil Liberties Union of Texas was quick to shoot back in another post: “You can’t ban speech just because it has ‘f@ck’ in it,” they wrote, followed by a citation of the 1971 Supreme Court case, Cohen v. California, in which the court overturned a man’s conviction for wearing a jacket that read “F**k the Draft” in a courthouse. Nehls, a Republican who plans to run for Congress, according to the Houston Chronicle, did not get any defense from local District Attorney John Healey, who is also a Republican. "I did not believe it was a prosecutable case based on the definition of disorderly conduct," Healey said of the “F**k Trump” sticker. Nehls deleted his Facebook post on Thursday because “the owner of the truck has been identified,” said the Fort Bend County sheriff’s office in a statement. He also claimed that he had been receiving hate messages toward his wife and children that stemmed from the Facebook controversy. On Wednesday, Nehls held a press conference to address his actions, going back on his threat and recognizing free speech, but also voicing concern that the sticker could cause distracted driving, adding that “I think now it would be a good time to have meaningful dialogue with that person and express the concerns out there regarding the language on the truck,” according to the Associated Press.